Apologies for the wait between this post and the previous one. The intensity of finalising work and putting together a pop-up exhibition to celebrate the project was much more time consuming than anticipated. Suffice to say, all works were completed and the show a great success, with the audience comprising of French and British local residents, all very interested and excited to find out more about what we had been up to and our working methods. 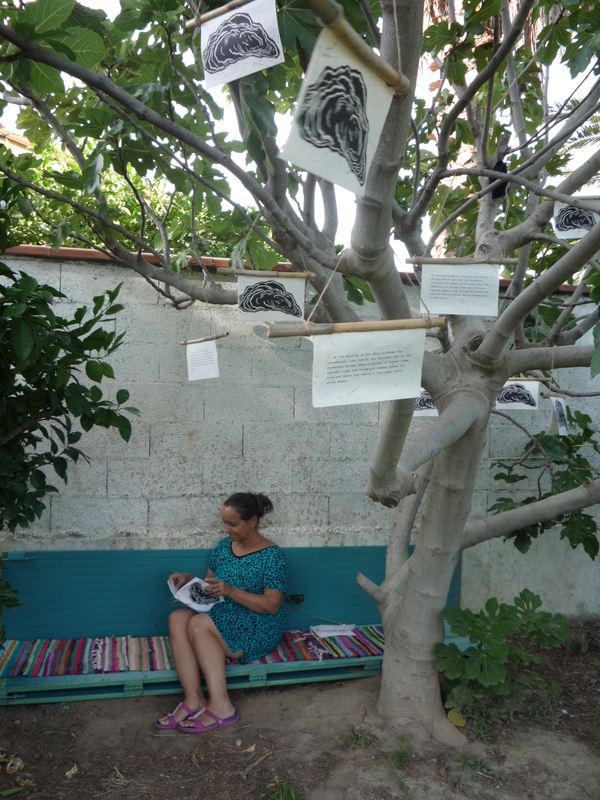 Theme Four: The Fig Tree, was an evocative installation in and around a beautiful fig tree at the end of the garden where the residency was taking place. Theme Two: The Sea was initiated by Zu, creating a haunting soundscape which encapsulated her love of wide open spaces and her previous experience of working on the sea. Theme Three: Isolation was initiated by myself. As ever, I worked spontaneously with the camera, finding ways to evoke the notion of isolation, what it is or can be, and invited Sara to perform for me as part of the piece. Theme Four: The Fig Tree was developed out of a desire for Sara to reimagine something from the Everyday. She provided us with a beautiful short story to respond to, the result being an installation comprising of lino print (my contribution), soundscape, and written story. I so enjoyed having the opportunity to work in print and created an abstract image which can be read as many things relating to the story; landscape (or mapping), sustenance and memory. We have decided to use this image as our logo. In addition to all of the above, and possibly the most challenging piece of work, was the children’s animation. Back when we hatched the plan to come together for the residency, it was important for us to involve them in the creative process. The end product, The Kids at the Beach, was a colourful and fun response by the children about some of the things they get up to on a day at the beach, which they wrote, shot and produced themselves (with a little bit of support from us). Dear Readers please note – fireworks were also included (for or those of you who have been following this blog, the inclusion of fireworks in the animation will come as reminder of our first day together).